Gavin Cogdon holds his head in his hands after a chance went begging. All pictures by Kev Wilson. 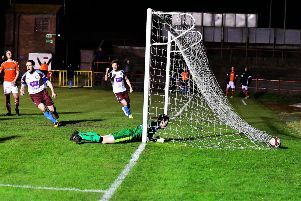 South Shields slipped to their second defeat of the season yesterday after a disappointing 3-0 reverse at North Ferriby United. The Mariners were off-colour in Yorkshire and failed to build on their 3-0 win over Stafford Rangers on Saturday. Dillon Morse looks on after an effort from Gary Brown was cleared off the line. Lee Picton and Graham Fenton made four changes to the team which beat Stafford, and they had a bright start. The lively Josh Gillies got in behind on the inside left of the box and fired a ball across which the hosts did well to clear. North Ferriby sent Shields two warning signs soon after, with Luke Hinsley and James Piercy both sending efforts just wide. They took the lead in the seventh minute when Hinsley powerfully headed in a pinpoint corner from the right. Dillon Morse kept the deficit at one for the Mariners when he produced a brave block to deny Luke Lofts. The Mariners improved midway through the half and threatened an equaliser. A Gillies free-kick bounced in a dangerous area and was well saved by goalkeeper Lewis Exall, who also held onto a shot from Gavin Cogdon. Shields almost levelled just after the half hour mark when a Robert Briggs effort was blocked - with penalty appeals for handball waved away - before Morse’s follow-up was saved by Exall. After Cogdon went close to an equaliser, Shields were hit with a sucker punch on the stroke of half-time when Jordan Harrison beat Liam Connell with a superb chip from 30 yards. The Mariners probed well at the start of the second half and almost pulled one back when Briggs forced Exall into a decent save with a strike from the edge of the area. Gillies was a constant threat to the home back line, but Shields were unable to make the most of the opportunities he created. Gary Brown went closest to pulling a goal back when his header from a Phil Turnbull cross was cleared off the line and Briggs dragged an effort wide from just outside the box as time slipped away. With Shields committing more men forward in the closing stages, they were hit on the break a minute before the end and Hinsley slid in his second goal to seal the points for the Yorkshire side. The Mariners are back in action on Saturday, when they will bid to maintain their 100% home record as they take on Nantwich Town. SOUTH SHIELDS: Connell, Hunter (Baxter 46), Lough, Turnbull, Morse, Brown, Wright (Mouanda 55), Briggs (c), Cogdon, Pattison (Cowburn 73), Gillies. Subs not used: Pearson, Adams.